In our last blog post, we were wondering how the world would look like if information could be copyrighted. This is exactly the scenario that Claude Ecken speculates about in his short story entitled Le Monde, tous droits réservés (The world, all rights reserved). In such a world, witnesses to a murder would enjoy a temporary copyright on the story that they could sell to the highest-bidding journalist. And governments would enjoy a copyright on all the information related to natural disasters occurring within the country’s borders — they could then sell it to international media and collect emergency funding. In such a world, journalists wouldn’t be able to produce papers from their office by blending and rephrasing press releases — they would have to earn the (copy)right to exclusive content by moving fast and moving first, and they would be compensated by royalty payments. Ecken's novel may be a fantasy, but copyright itself at the behest of recording and movie industries is becoming fantastic. Rather than promoting an open and respectful copyright system, interested parties are attempting to turn information and knowledge itself into an asset, one that is not allowed to circulate freely. Complicating this crackdown though, is the uncharted territory of Cyberspace which is opening up new common territories of information. These new territories are more usefully viewed as a common territory or open space, not reducible to the complex legalities of copyright infringement and ownership. The value of information is diverse, and this value exists in the communicative nature of its form. 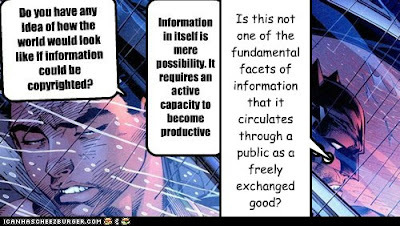 McKenzie Wark, in A Hacker Manifesto, draws out the more subtle action that makes information valuable: “Information in itself is mere possibility. It requires an active capacity to become productive” (§136). Instead of being free then, it seems that information wants to be shared; and shared promiscuously. Information is perhaps best conceived as a gift that circulates in an information commons. David Bollier writes in his book Silent Theft that a "gift economy is a web of enduring moral and social commitments within a defined community sustained through the giving of gifts (goods, services, courtesies) without any assurance of personal return” (31). Is this not one of the fundamental facets of information that it circulates through a public as a freely exchanged good?A recipe exists on an index card, but it is not the index card that produces the information, nor the ink that conveys information, or the link that is clicked on. Rather it is the ideas; the intangible facts, measurements, and likely the user’s disregard and modification of the recipe that produces a delicious meal; it is the communication of the recipe and the changes to it that create value in making it taste better, or making it healthier, perhaps through the substitution of ingredients, or some other change in its original (if there can be an original) manifestation. To take this further, should information be not conceived in this fashion since it is always/already constituted in this way?